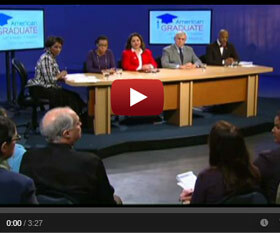 Part of the American Graduate Day 2013 WMHT local segment. Tune in 9/28/2013 2:30-4:30pm. Linda Stephen has been a member of Girl Scouting for over 26 years, becoming a member of council staff in late 2002 and serving as Series & Event Pathway Supervisor since 2010, where she is responsible for creating leadership development programs for girls grades K-12. Linda feels that the program and mission Girl Scouts offers allows girls the ability to explore their interests, teaches values, helps in developing critical thinking and aids girls to become exceptional leaders in our communities locally and globally. Prior to her Girl Scouting career, Linda worked for many years at IBM in the Set Test Department with Main Frame Systems building, testing and tooling. Girl Scouts is the largest girl-serving organization in the U.S. and is focused on leadership development for girls grades K-12. Having celebrated 100 years in 2012 of building girls of courage, confidence and character to make the world a better place, Girl Scouts of Northeastern New York serves 11,000 girls and 5,000 volunteers throughout 15 counties: Albany, Clinton, Columbia, Essex, Franklin, Fulton, Greene, Hamilton, Montgomery, Rensselaer, Saratoga, Schenectady, Schoharie, Warren & Washington. Offices are located in Albany, Halfmoon, Queensbury and Plattsburgh. For more information: GSNENY.ORG or (518) 489-8110. Dr. Jennifer Goodall received her undergraduate and masters degrees in Classics at Tufts University while working on the Perseus Project. Her research focused on women in antiquity. She completed her Ph.D. in Information Science at the University at Albany with a specialization in Information Technology and Learning. Her dissertation examined trust and power issues surrounding information sharing among homeless providers in New York City. She has been teaching undergraduates at the University of Albany since 2002 and has noticed a decline in women students in her classes. She has been Assistant Dean of the Department of Informatics since 2007 where she directs the undergraduate program and leads the College of Computing and Information Women in Technology (CCIWIT) initiative. She also works with the National Center for Women in Information Technology (NCWIT) as an Extension Services Consultant. She is spearheading the creation of a New York Girls Collaborative Project this fall. She recently received the Bread & Roses Award on the UAlbany campus for her dedication to promoting the quality of life for women on campus and off campus. The College of Computing and Information Women in Technology (CCIWIT) program at the University at Albany is dedicated to supporting, empowering, and building community among female faculty, graduate, and undergraduate students. The CCIWIT Technology Outreach Program encourages girls and boys in elementary, middle and high school to pursue studies in the fields related to computing and information and increase their confidence and skills in technology. The CCIWIT initiatives are designed to address the critical need to increase access and opportunities for women to enter the male-dominated computing and information technology fields. Popular CCIWIT initiatives and projects are the Junior FIRST Lego League Expo for 6-9 year old children, the Social Robotics Workshop for kids of all ages, and the New York York Celebration of Women in Computing for college students in New York state.